Evaluate the distance to any object with the triangulation feature. You can also measure its height once the distance is known. This is not done by showing any unreadable cursor on the screen, but with mathematical formulas under the hood. Choose between metric and imperial measure systems. 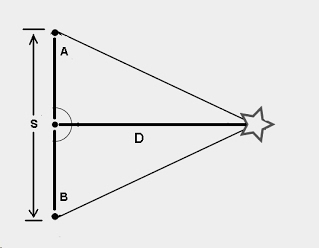 In ordinary land surveying, imagine a distant mountain peak and two observers are located at 'A' and 'B' separated by a few miles (the length 'S'). The base angles at A and B can be measured with an instrument called a theodolite. By knowing the base distance A to B, and the baseline distance S, the distance to the peak can be worked out with a simple scaled drawing or with trigonometry. By using this principle, GeoCam can calculate the distance between you and something remote: a mountain, tree, building... It is located in the "Geo" > "Triangulation" > "Distance" menu item. You will be asked to point to the object a first time, then touch the screen and move aside, then point to it again. Validate by touching the screen again. From your two GPS locations and the direction of the object from them, GeoCam calculates you the distance D.
The distance to the object needs to be reasonably long as your GPS sensor is not that accurate (5m at best). You wouldn't get accurate results for shorter distances. The locations from where you point to the object also need to be distant. You need to move at least three to four times the accuracy of your sensor which is displayed in the GPS gauge and - the more the better - 5 times if you can. Always move SIDEWAYS, not towards the object nor away from it. After you move, give your phone a few seconds to augment the fix's accuracy. Be very accurate when you point to the object. Use the crosshair ("Menu" > "Set" > "Show cursor") and target it. Remember that the limitation here is the accuracy of your sensor, and you accuracy when pointing. The maths are perfectly accurate. If you know the distance to a remote object or have calculated it with triangulation, you can use GeoCam to measure its height. You will be asked to input a distance and from there point to the bottom of the object. Then touch the screen, point to its top and touch the screen again to see the result. Again do not rush, give time to the cursors to stabilize before touching the screen.